Pallet Wrap is vital for use in warehouses where boxed goods are stored or transported on pallets. The wrap helps to prevent any boxes from falling off the pallets when shipment conditions get rough. As well as securing items pallet wrap also helps to protect them from the likes of dust and water damage. Machine applied pallet wrap is used in conjunction with a pallet wrapping machine so that it can be applied quickly and effortlessly. Using machinery speeds up the wrapping process and eliminates the need for manual work that takes time and energy. 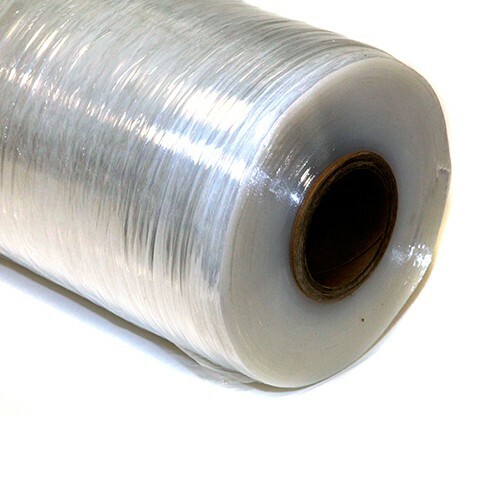 Machine applied pallet wrap is made to the highest of standards ensuring that it can withstand everyday wear and tear. Difficult to tear or puncture you will not be disappointed with our pallet wrap.